Permit Issued! See Why It Should Be Preserved. Update: The Harris County Flood Control District last week signed the project permit sent to them by the Corps of Engineers, according to a source who was at a quarterly meeting of the Flood Control District Task Force today. But District Director Russ Poppe told the task force that the project will now cost more than the original $6 million price. In other parts of the world – India, New Zealand, for example – rivers have been recognized as living entities, accorded the same right to health and life as a person. In the United States, a corporation has more rights than a river – even more rights than a person. Rivers nourish life. They are a vital part of our ecosystem — draining, cleansing the water that falls from the sky and runs over and under the land, sending it back to the sea to be used again. In Houston we are unusually fortunate to have a long stretch of relatively wild and wooded bayou flowing past Memorial Park in the middle of the city. If we float down and around the bends of the bayou here, or walk along the neglected footpaths through the riparian forest, over and around the deep ravines that feed into the bayou, along the soft sandy banks and through boggy marsh, pausing on the high edge, we can observe our natural history, the geology of Houston, the ancient sandstone and tall bluffs, the natural cycle of growth and change, erosion and renewal of the bayou and the wetlands along its banks. We can see the tracks and nests of beaver, turtle, coyote, alligator, and more, hear the sounds of songbirds and skittish rabbits, watch herons and egrets sail gracefully downstream, hawks wheel in the sky, and breaking the surface of the water, the long back of the scaly alligator gar , one of the largest and oldest freshwater fishes in North America, now extinct except in parts of the South. This 18,000-year-old meandering bayou flows eastward from the prairie in Katy to Galveston Bay for some 50 miles. Known as the Mother Bayou, most of our numerous bayous, creeks, and streams flow into it as it makes it wandering way to the bay. Some of the bayou has been straightened. Much of it has been thoughtlessly landscaped or reinforced without awareness of its natural process or our responsibility for the living river as a public trust. Most of it is inaccessible by foot to the public, the banks being privately owned. Our state constitution, of course, guarantees access to this publicly owned waterway through public land. But this last remaining forested stretch flowing freely past the eastern section of Memorial Park is accessible to the public. And it is unique in that both banks are wooded, the south bank being a private golf course, though the River Oaks Country Club unwisely has cut down the tall trees from some of the upper banks of this waterway, leaving little to protect the denuded banks from erosion. This is the 1.25 mile stretch that the Harris County Flood Control District has targeted for razing and rebuilding, reshaping every meander and most of the channel, at a minimum cost of $6 million, not including future maintenance and repairs. This is the stretch that we are fighting to preserve. Our opponents often allude to the fact that this is not pristine forest, or that settlers cut down the trees once, or that flooding has altered the banks, or that tree roots holding the bank in place are bare (as always happens along streams: the bared roots naturally grow bark for protection) and that trees fall in the water (also natural and necessary: fallen trees filter sediment, stabilize banks, and provide wildlife habitat). None of these arguments is a reason for cutting down the trees and digging up the banks. Nature is always changing and adapting. Without change, there is no life. 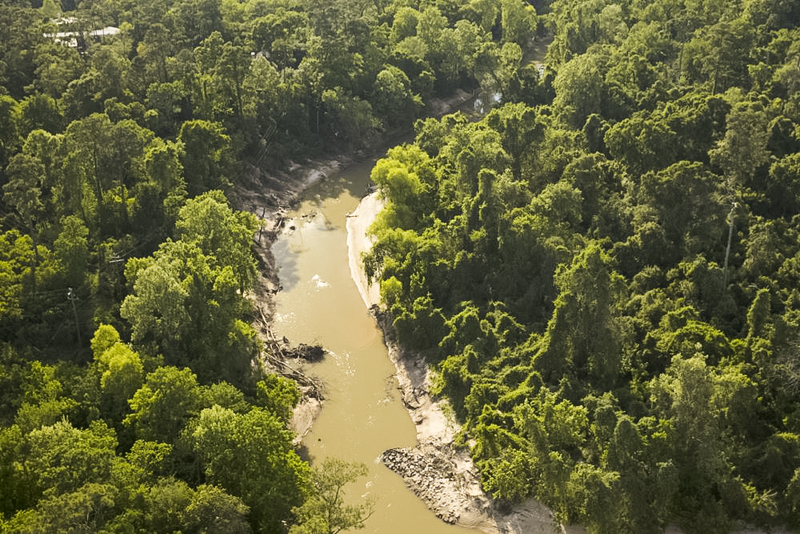 Read the rest of this post and watch a stunning slide show of aerial photos of Buffalo Bayou taken by Jim Olive on April 7, 2017, in the proposed destruction zone. The public is invited to a celebration of the life of Terry Hershey, who long ago not only helped save the life of Buffalo Bayou but worked for decades for parks and the environment. Hershey died in January in Houston. 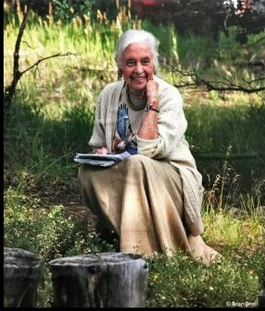 She will be honored Tuesday, April 25, at 10:30 a.m. with a planting of five bur oak trees in Buffalo Bayou Park on the south bank of Buffalo Bayou between Eleanor Tinsley Park and the Henry Moore Sculpture. Apparently the ceremony is taking place in Buffalo Bayou Park because the park named after her on Buffalo Bayou in far west Houston remains closed for $1.25 million in “repairs” by the Harris County Flood Control District. Hershey most certainly would have objected to this damaging construction work involving the removal of trees and extensive excavation and armoring of the banks with heavy equipment.